Cats don't belong on the kitchen table. This better not be starting a trend. 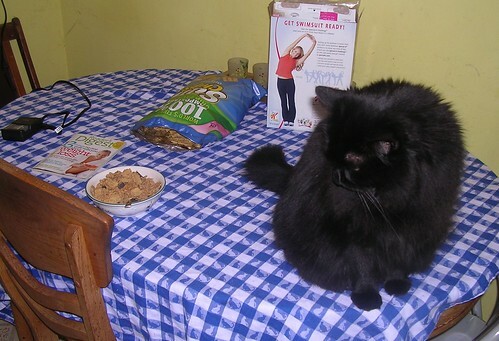 Penney used to get on the table. It was impossible to break her of this habit. I would be doing dishes to the right, off the photo, and I'd feel cat paws on my back as she meowed for attention. Nope, I'm not amused. This may be because the table is pushed away from the corner so Carole, David and I can eat around it. Opportunity! She does think she's hot stuff, however.